Fanciful dragonflies meander among alternating richly textured stripe and bobble motifs on this pretty afghan. 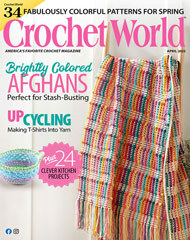 This e-pattern was originally published in the July 2006 issue of Crochet! magazine. Size: 41 1/2" x 52". Made with medium (worsted) weight yarn and size G/6/4mm hook.